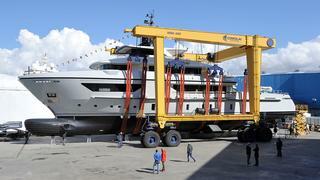 Sanlorenzo has launched the second hull in its 460EXP explorer yacht series, named X. 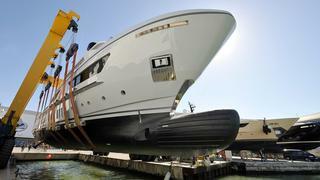 The 42.4 metre yacht has a steel displacement hull and aluminium superstructure. Like the other explorer yachts in the series, she has been designed to offer a blend of self-sufficient cruising and durance with the finest comfort and technology on board. The external lines of X are strong and imposing, reminiscent of the big exploration ships that explore the most secret of areas. Her superstructure has been shifted forward to leave plenty of space on the main deck for the storage of toys such as a submarine, seaplane, sailing or fishing boats, or a large tender (up to 10 metres). When the toys aren’t on the main deck, the huge area can be used as a wide solarium. X has a sun deck that’s fully equipped as an outdoor gym and the main deck features a swimming pool with an artificial current for endless swimming. X’s Mexican owner chose a layout with six cabins and an additional family room. Her interior has been designed to reflect the owner’s adventurous yet refined taste and style. X’s interior saloons are furnished with Minotti design pieces only, for example. Unlike the first hull Moka, which has an olive green hull, X’s owner has chosen a pearl grey hull, which is visible in the launch photos above. Sanlorenzo revealed in September 2015 that another four hulls have been sold, with owners scattered across the globe. Moka completed her maiden voyage last month, when she cruised 5,600 nautical miles from Viareggio to Florida.